There is still time to sign up for the 2012 One Skein Project club. 4 shipments, 4 one skein project patterns, 4 different yarns and 4 destination themes. This is a fun way to try new yarns and a variety of projects. Exclusive patterns from Fiberdev. 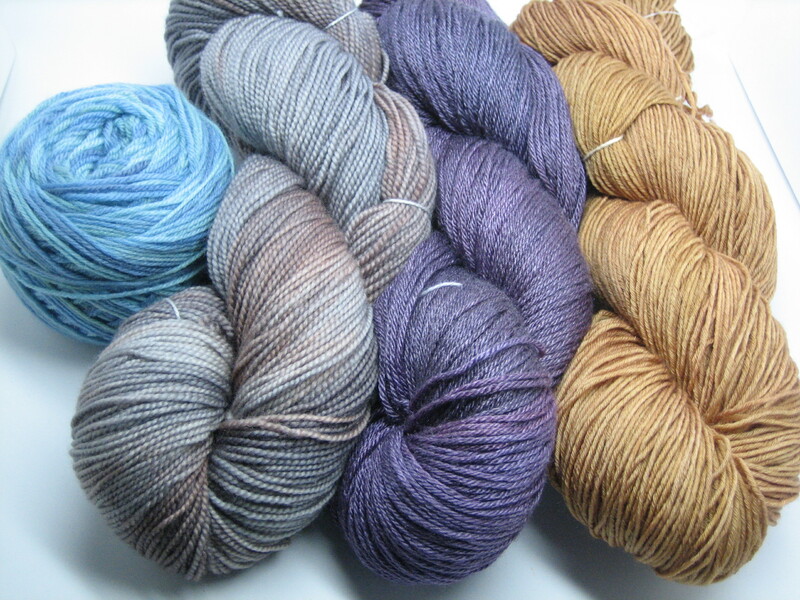 Yarns will vary from sock weight to DK weight. Come join the fun with us. I’ve just mailed out the last of the 2011 sock yarn travel club mailings. I’ve enjoyed the club for so many reasons. Its given me the chance to continue to work with the talented designer, Jocelyn Blair (aka Fiberdev on Ravelry) as well as explore new colorways. I love being able to play with themes and focus on a select group of skeins; mixing dyes, shifting colors, getting everything just right, watching the dyes strike and forever change the white yarns. Sometimes the themes came first, giving me ideas for possible colorways, other times I started dyeing and the colors inspired the theme. I’m influenced by my surrounds and have taken in the colors of the landscape without even noticing until… there, they show up in my dye pot! Club YARN !! 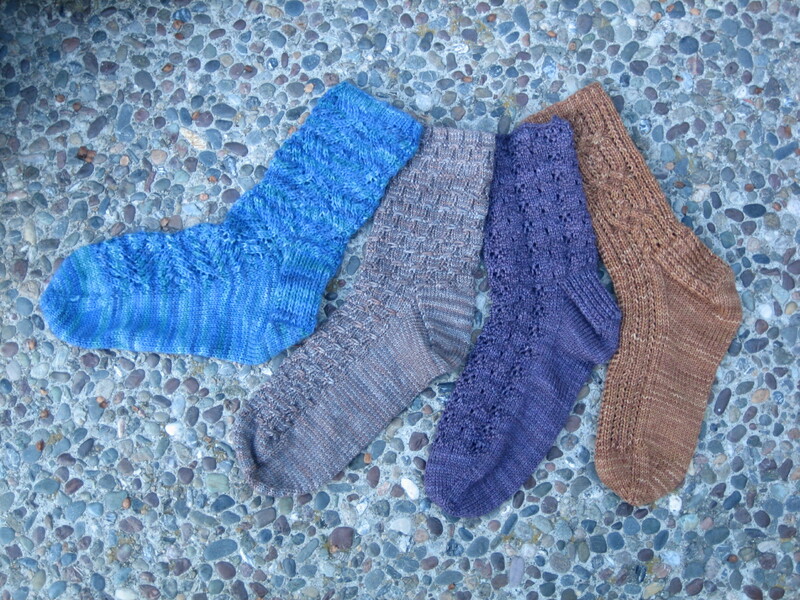 details for the 2011 Handwerks Sock Yarn Club are now up and open for sign up here. The 2011 club is inspired by 4 California destinations. I’m hitting all the high points – mountains of Lake Tahoe basin; northern rugged coastline of Bodega Bay; inland central Death Valley; and fun in the sun Santa Monica, southern California beach living. I’ll be dyeing and shipping yarns in Feb, May, Aug and November, giving you enough time to knit the wonderful sock pattern that will come in each mailing. Four seems just right, not too many so you are always behind… I hate that… and not so few that you are bored twiddling your thumbs in between. Come join the fun, sign ups are open. Sock Club, Sock Yarn Club, Travel Club, Sock Yarn Travel Club!!! I’m excited! I’m starting a Sock Yarn Travel Club. It’s a yarn club inspired by travel destinations- my two favorite things- travel and yarn or is it yarn and travel or traveling with yarn! Yup that’s it> A Yarn-cation! I love dyeing based on landscapes so these will be exclusive to the club new colorways taken from beautiful destinations. A featured designer will be helping me by providing a pattern as well and there will be fun things too. A postcard of the destination with the yarn. Each shipment will highlight a different kind of yarn. Only the best – cashmere, Blue Faced Leicester, merino, bamboo….. Details coming soon on my website.